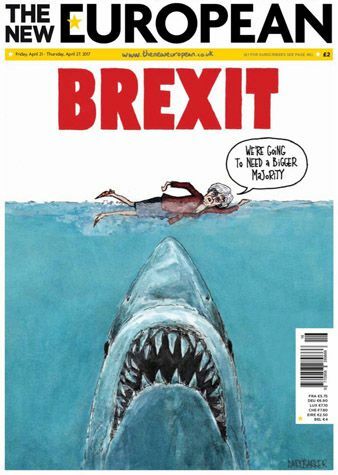 The looming threat of the Brexit Jaws monster threatens to eat Theresa May. The prime minister calls a snap election in order to gain a larger majority and so ensure that the government has as little opposition to its hard brexit as possible. Sadly for Theresa May and the Conservatives, her gamble didn't pay off and the general election resulted in a hung parliament wirh Jeremy Corbyn led Labour doing far better than the polls and the pundits suggested. In fact considering the media onslaught smearing the Labour leader in the two years since his election as leader the result could be described as remarakable and a real shock to the egos of the media oligarchs who think their word is law.